Surname History Berkhof(f) means literally `birch-farm´ or `birch-farmhouse´ and falls as such under the so-called farm names. Such a name served as an address when street names were not commonly used. To leave no doubt there would have stood a birch tree in the yard. Certainly not all farms received a name. This was only the case when the owner was a leading figure in the neighbourhood or if he leased out the farm to a third party. In the last case a name made the farm and the belonging land easily identifiable. That was from a judical point of view important for the preparation of official documents. But it was also convenient for the owner when he had more possessions and kept extensive (financial) records. Fairly common practice in farm names was that the lessee (tenant) of the farm and his family received the farm name as an addition behind the first name and the patronymic. Primarily, however, was the name connected to the farm and the yard. This meant that a new succeeding lessee and his family could also become known by the farm name. This way several unrelated families can have their name derived from one and the same farm! Because the lessee and his descendants that had left the farm, often continued in using the farm name by which they had become generally known. But he or one of his (grand) children could also adopt a new surname. For example from another farm, or one derived from a craft. After the introduction of the Dutch Civil Registration around 1811 and the German Standesamt in 1876 these changes of surnames were not possible anymore. But the practice that farm names determine the name by which a person is known, still occurs in some regions. For example in Vriezenveen. A person's official name is sometimes not even known there; only at the Civil Registration. That the name Berkhof(f) is indeed derived from a farm with that name, is so far only demonstrated in black and white by the Dutch family tree Lunteren. The farm was owned by the Church of Lunteren and was known for years as Berkhof when in 1738 a certain Hendrik Jansen (read: Jan-son) came there to live. He and his children became known as the people `Van den Berkhof´ and `Berkhof´. Descendants who no longer lived on the farm continued using the name. Illustrative for the fact that farm names were used as addresses, is that the road to the Lunteric Berkhof farm, later (in the nineteenth century) received the name `Berkhofweg´ (Berkhofroad). Unfortunately, reconstructing the name origin is not this `easy´ for other family trees. 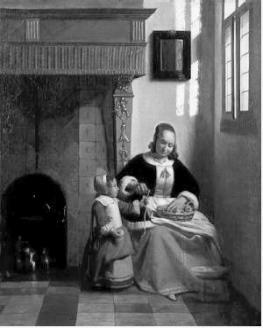 For instance, around 1777 in the nearby Kootwijkerbroek a certain Wouter Willemsen (read: Willem-son) and his children from his third marriage adopted the surname Berkhof. Why remains unclear. His children from his first two marriages only used the patronymic `Wouters´. His brothers and father who were born in Harskamp used only a patronymic too and there seems not to be a relationship with the family tree Lunteren. For the family tree Kootwijk the surname seems to pop up out of the blue. From other farms it is suspected that they have determined the adoption of the Berkhof(f) surname. So live near the former Berkhof farms in Udenhout and Overa (still) many namesakes. These are family trees we know little to nothing about. The earliest known references to these farms date from 1541 and 1495. Such relation cannot be made with the former Berkhof-farm in Oldeneel near Zwolle. This farm, which appears in a document from 1521, seems to have had no name `name-legacy´ in the region. In Germany further, three farms are located near Dordmund in Flierich and Ahlen-Dolberg. In the last mentioned place there are even two, a large and a small one. The surnames Berckhoff, Grosse Berkhoff and Berkhoff that can be found there, will certainly have a relation. Near Hannover even a village called `Berkhof´ can be found. It is already mentioned in 1381 as `Birkenhof´. It can be found just North of Hannover at the A7 motorway and is known throughout Germany for its traffic reports. It is quite possible that the Berkhoff surname bearers in the nearby villages Peine and Liebenburg derive their name from it. Unfortunately, we know little about the use of the name in the Hannover and Dordmund area. Except that in the 17th and 18th centuries many namesakes from the Dordmund area went for economic reasons to the cities of the provinces South- and later North-Holland, like Rotterdam, The Hague and Amsterdam. Many descendants of these Hollandgänger can today still be identified by the `German spelling´ with -ff-. For the same Dutch -ò- sound is in German an extra -f- needed. A single -f- gives an -ó- sound and the pronunciation -hoof-. And that's obviously not what is meant in German. The spelling with a single -f- is in the Netherlands by far the most frequent, but it cannot be found in Germany! But all this brings us already to the influences of regional dialect on the spelling of the surname. Barkhoff still occur. Possibly in relation to the former `Barkhof´ farm in Bremen. The -e/i- sound change is characteristic along the river Rhine and can be found in both the Central and High German dialect areas. The name Birkhoff however can only be found in the so-called Rhinish Fan, a melting pot of Low Franconian, Low German and Central German language varieties. 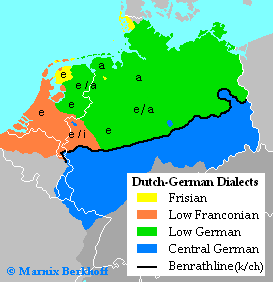 In the Netherlands, the name Birkhof(f) only occurs in the Utrecht region and in the German spelling with -ff-. Possibly the estate Birkhoven in Amersfoort played a role in this. Differences in regional usage left their mark primarily when people moved from one region to another. Studying 17th and 18th century Amsterdam Bann records gives us clear examples of this. As economic driving force of the Dutch Republic, Amsterdam attracted large numbers of fortune seekers from all around. In the Bann records we can see that city officials wrote the names of immigrants from -a- and -i- sound areas default down as Berkhof(f). This is quite well visible when the bride or groom in question could write their own name and used an -a- or -i- themselves. Being able to write their own name, proved to play a crucial role in the handing down of the spelling. Until it was finally set down with the introduction of Civil Registration in 1811. But the Amsterdam Bann records show us more. For example the spelling with -c- and -ck-, which fell into disuse in the mid-18th century. And the notation `Berkhoven´. This name appears only in early 17th century records, with places of origin like Haarlem and Leiden. Perhaps the name has in these cases still a relationship with the village Berkhout (`birch-wood´) in the province of Noord-Holland, which was in the 15th and perhaps the 16th century known as `Berkhoven´. But several immigrants from the German city of Hamm signed their Banns in the early 18th century with this name too. The city official quoted in their case also default `Berkhof(f)´. Thus it seems likely that the name Berkhoven is an archaic spelling of the name Berkhof(f). The name does not occur in The Netherlands or Germany any more. A special case is the name Berghof(f). This name literally means `hill-´ or `mountain-farm´ and has always been a common name in the German Sauerland. Partly because of the different meanings of the names, Berkhoff and Berghoff seem in the neighboring Ruhr area not too has caused to much confusion. Amsterdam city officials however, translated this name also into Berkhof(f). Possible wrong-footed by the phenomenon that is now known as the Benrath line; the -k/ch- sound transition, as expressed in -ik- and -ich-. The only occurring Berghof family in the Netherlands lives in and around Maastricht. It is possible that this family derived their name from the hamlet Berghof near Gulpen. Like in the family tree Zijen we see in this family tree too that one of the descendants adopted around 1811 the more Dutch spelling. So in the Maastricht family tree both the names Berghof and Berkhof occur. Finally, a word about the in America occurring names Barkoff, Berkoff, Birkoff and Burkoff. In English, the -h- of -hof(f)- is not pronounced and the ending -off- seems at first sight to be an anglicizing. The origin of this name is however not in the Netherlands or Germany, but in Eastern European countries like Poland, Romania, Belarus and the Ukraine. In the early twentieth century many people emigrated from these areas to the New World. In drawing up naturalization forms on Ellis Island, the American Immigration Service translated patronymics such as the Russian endings -ov-, - ovitch- and -ovsky- into the more American (?!) sounding -off-. Actually similar to what had happened in 17th and 18th century Amsterdam. So, the surname is in these cases not derived from a farm name, but it is based on a first name!